Earlier this week, U.S. News released its annual rankings of the best U.S. medical schools for primary care and research. 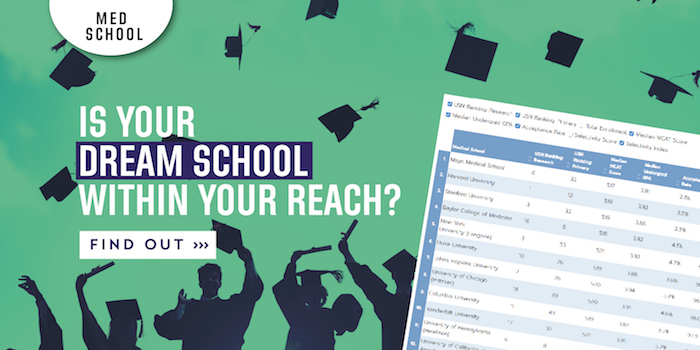 Potential students can check out the data in the 2020 U.S. News medical school ranking to assess their competitiveness. U.S. News medical school ranking is calculated based on expert judgements about program excellence and statistical information measuring the quality of a school’s faculty, research, and students. Peer assessment data was gleaned from deans, program directors, and senior faculty, who evaluated the quality of programs in their field on a scale of 1-5, with 1 being marginal and 5 being outstanding. This year, U.S. News made several changes to the methodology. Four factors that measured non-National Institutes of Health (NIH) research were eliminated. The weight of the total NIH research dollars ranking indicator was raised to compensate for the eliminated indicators. Family medicine was put back in as a specialty. Statistical indicators are composed of inputs, which measure the qualities that students and faculty bring to the program, and outputs that show how much graduates’ achievements are related to their degrees. Each indicator was weighted according to U.S. News’ conclusion about their relative importance based on discussions with experts in each field. Looking for more information on how to use these rankings to determine the best programs for you to apply to? Need advice on how to measure your competitiveness relative to other applicants at your target schools? Get in touch – our expert advisors are ready to guide your through the medical school admissions process from start to finish. View our Medical School Application Services for more information on how we can help you get ACCEPTED.